Our uniformed security personnel provide services for special events or on a continual basis in Maryland and West Virginia. Full- and part-time on-site security guards for any situation on a full-time, temporary, or holiday basis. Marked security vehicles provide a roving patrol for any setting. Our patrol vehicles are equipped with top-quality communications equipment allowing officers to have immediate contact with local law enforcement. Clients are also able to have direct contact with security officers on duty. Scotty's personnel are also available for transporting sensitive items such as pharmacy supplies, medications, home health equipment, and much more. Courier operations are available 24/7--when needed most. Scotty's experienced security professionals are also able to transport items of a potentially volatile nature, such as cash, narcotics, and financial institution transactions. Rest assured--when your company needs the best for a high-stakes delivery, Scotty's is up to the task. 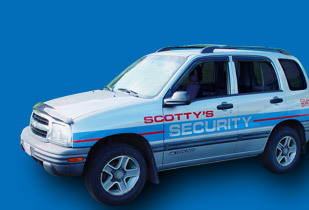 Scotty's Security will deliver and verify receipt of court papers to required parties. Scotty's will find and deliver. Period. Our experienced professionals work effectively in the delicate situation of default on credit. We work to resolve situations through guidance and mediation. Taking custody of a vehicle is our last resort, and we supply a report of the details of the event. 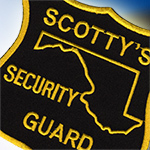 When the pressure mounts to maintain the safety of property or individuals, let the experienced staff of Scotty's Security be your pillar of security. Call us today to find out more about how we can protect you.